The Tarragon Theatre has opened its 2014/15 season with an exciting, highly imaginative production of Henrik Ibsen’s An Enemy of the People. Florian Borchmayer’s adaptation which has primarily streamlined the action and rephrased the dialogue in a contemporary idiom makes the play from 1882 seem so modern it could have been written yesterday. It’s too bad that director Richard Rose can take no credit for the production’s insights. He obviously admires German director Thomas Ostermeier’s 2012 production of Borchmayer’s adaptation for the Schaubühne am Lehniner Platz, Berlin, so much that his production is not merely inspired by it but actually seeks to recreate it for a Toronto audience. In fact, if you are travelling to London, you can see Ostermeier’s original production, now on tour, which plays at the Barbican September 24-28. The action is set in a small town in the middle of nowhere that has recently become popular as a spa town. It was the idea of Dr. Stockman (Joe Cobden) to create the baths by diverting water from a nearly river, but it was the decision of his elder brother Peter (Rick Roberts), over Stockman’s objections, to place the intake for the baths downstream from local factories, including that of Stockman’s father-in-law Morten Kiil (Richard McMillan). When some recent tourists who came to be healed left with various diseases, Stockman had the water tested by a scientist at the university who found that the water is indeed contaminated. Ibsen doesn’t specify what the contamination is but Borchmayer’s adaptation has merely to mention e. coli for us to see the relevance. Stockman is naive enough to believe that the town will welcome his discovery so that it can fix the problem. He tells Hovstad (Matthew Edison) the editor of the local newspaper and Billing (Brandon McGibbon), his subeditor, who want to use the discovery to pull down the establishment that dominates the town council. Even the newspaper’s owner Aslaksen (Tom Barnett) is on Stockman’s side. All seems positive until Peter, a town councilman, points out that it will costs $60 million to relocate the intake and force the baths, the town’s main source of revenue, to shut down for two to three years, during which time the baths will have lost their reputation and its clients will have gravitated to other spas. Peter’s argument persuades Stockman’s former supporters to turn against him. Peter finally gives his brother an ultimatum either to issue an apology for publishing “false” information or to conduct another study that finds the water is safe or else to lose his job as the chief medical offer of the baths of which Peter is the CEO. With a wife Katharina (Tamara Podemski), who is only a part-time teacher, and a baby son, what is Stockman to do? to examine the reasons why a society does not feel morally compromised when it chooses to live with lies rather than face truths. For wider parallels, one need only look at the debate over global warming. Or for a truth-teller reviled by those in power one need only look at the Edward Snowden affair. In recreating Ostermeier’s production, Rose has given designer Michelle Tracey the unenviable task of reproducing Jan Pappelbaum’s original set design for the Schaubühne. Ostermeier deliberately countered the naturalism of Ibsen’s drama by placing it in a non-naturalistic setting. Pappelbaum’s set consists of a room with chalkboards for its walls, covered in drawings, some of details of the room, some of furniture, some just fantasy images like the shark from the poster for Jaws. The point of the set is to emphasize that Stockman and his friends live in a world of theory and ideas. Borchmayer adds the notion that Stockman and his wife have formed an indie band with Hovstad and Billing, to show how the four are linked by age and, initially, ideals. It’s no accident that the song they sing together is David Bowie’s “Changes” with its highly appropriate chorus “Time may change me, But I can’t trace time”. It is fitting that the same set serves as the office for Hovstad and Billing, who dream of toppling the establishment. When it comes time for the Act 4 town hall meeting when Stockman is to explain himself, Ostermeier has Stockman’s opponents literally whitewash the walls of the set in, perhaps, an over-obvious physical metaphor for what these characters plan to do to Stockman’s report. At least Rose has allowed Tracey freedom to design her own costumes for the Tarragon production to reflect North American styles and her own ideas for what is drawn on the walls. 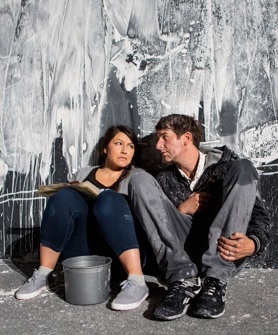 Yet, as in Ostermeier’s production, Rose has characters write the name of the location on the wall, a clear reference back to one of Brecht’s so-called alienation effects. There are peculiarities to Ostermeier’s direction that Rose repeats. The play begins with an excerpt of Stockman’s speech on a scrim in front of the stage before the action begins. Later, we see this speech projected on a “television” drawn onto the wall, long before Stockman gives the speech. Is this meant to undermine the speech as unoriginal? Ostermeier also suggests through a long kiss between Hovstad and Katharina that an affair is or had been going on. Since nothing comes of this, it looks like a feeble attempt to make sure her character is undermined along with all the rest. Ostermeier and Borchmeyer’s best idea is to have the audience represent the citizens in the town hall meeting that Stockman calls. Directors have done this before but this time Rose via Ostermeier actually encourages audience members to speak out in response to what characters say. This is both exciting and slightly dangerous since we can’t know how off-kilter the audience’s remarks will be. At least on opening night, Rick Roberts, who received the brunt of audience criticism as the most obvious “bad guy”, was superb in deflecting criticism just as his politician character would. Also remarkable about this scene is how Ibsen allows Stockman to go off the deep end in his rant against society. In the original his speech becomes virulently anti-democratic and he even states that, “The majority never has right on its side”. He says that the (capitalist) economy does not cause problems but is the problem. It is an extremist speech that is meant to disturb people both on the right and the left. In the original Stockman is heckled as a “freethinker”. In this production he is heckled as a “leftist fascist”, which, paradoxical though the term may be, sums up what Stockman says. The image we get is of a good mind pushed over the edge and self-destructing in public. Stockman may think he has nothing left to lose, but the play’s finale shows that there is much more to lose than one can imagine when a person attacks the foundations of a society. If none of the innovation of the production can be accorded to Richard Rose, he at least must be given credit for having drawn superior performances from his entire cast. Cobden has never taken on so complex a role and succeeds in it masterfully. He guides us through Stockman’s journey from a nerdy, naive scientist to a rabid social critic who suddenly must confront the abyss that opens when everyone, including his friends, abandon him. Rick Roberts is chilling as a brother who turns against his own brother when political survival and financial gain is at stake. Matthew Edison and Brandon McGibbon reveal their characters as faux-idealists in different ways – Edison cunningly, McGibbon almost unconsciously – both qualmless about betraying a friend. Tom Barnett makes us doubt Aslaksen’s sincerity while Richard McMillan makes us fear Kiil’s power from the moment we first meet both of them. Except for the unconvincing fling forced on Katharina, Tamara Podemski wins our admiration as a woman who stands by her husband during his downfall even though it takes her with it. Borchmeyer, who skillfully combines Mrs. Stockman and the Stockman's’ daughter to create Katharina, makes her plight more difficult by giving her and Stockman an infant son instead of the two sons aged 13 and 10 in Ibsen’s original. While the notion of the Stockmans being in a band with Hovstad and Billing may be unnecessary, it is surprising how little Borchmayer has to alter Ibsen’s original text to make the action play out as if meant for a world of cell phones, television, radio and computers. The current production demonstrates how thrilling a play by Ibsen can be when a director and cast are alive to all of its complexities. Even if Richard Rose has borrowed his directorial and design concepts from another production, we have to be amazed at how thoroughly this Canadian company has made that production their own. ☛ In the 2015 remount Laura Condlln played Dr. Stockman, David Fox played Morten Kiil, Kyle Mac played Hovstad and Lyon Smith played Billing. Tom Barnett, Tamara Podemski and Rick Roberts returned in their roles. The creative team remained the same. Photos: (from top) Joe Cobden as Stockman and Rick Roberts as Peter; Joe Cobden as Stockman and Tamara Podemski as Katharina. ©2014 Cylla von Tiedemann.